Though Shemeka and Charles have slightly different stories about how they met, they both agree that there was an instant connection that drew them together. Their mutual love for parties, bars, and easy conversation led to a natural and drama-free relationship. They are both "best friends" who enjoy doing everything together. Charles decided to propose on the 4th of July. Shemeka's sister and mother were clued in on the plan, but Shemeka had no idea. Due to pouring rain, Charles, Shemeka, and her family went to the Salem fair instead of a fireworks show, but she grew annoyed when the rain didn't stop and she was forced to take shelter inside the Salem Civic Center. The day seemed ruined, but that quickly changed when Charles brought Shemeka a funnel cake with "Marry Me" written on it. Charles was so nervous that he forgot to get down on one knee, but, after a sharp reminder from Shemeka's aunt, he dropped down and formally asked Shemeka to be his wife. The rain-soaked crowd and Shemeka's entire family began to cheer. Despite the bad weather, the proposal ended up being absolutely perfect. 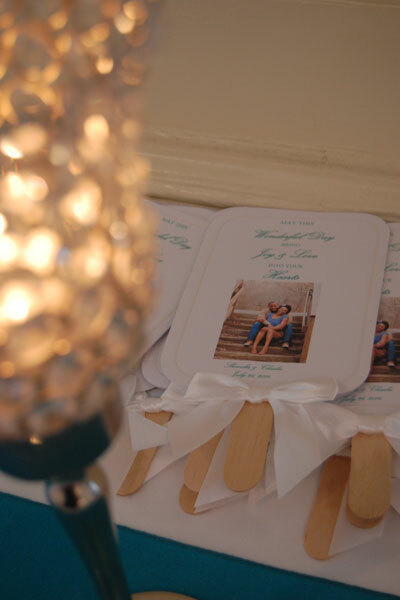 Since the couple met at a bar during happy hour, they chose to have a party/club themed wedding. After choosing the retro Hotel Roanoke as their venue, the club theme shifted to a "vintage club" theme. The bridesmaids wore classy and elegant cocktail dresses, and the groomsmen were dressed to the nines in vests and bright turquoise shirts. 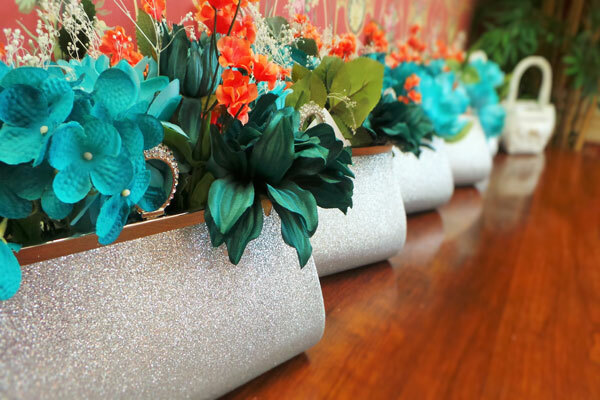 Rather than traditional bouquets, the bridesmaids carried unique silver "clutch" bouquets filled with baby's breath, jasmine, and greenery. The clutches matched the girls' sparkly pumps and made the club theme pop. Shemeka and Charles wrote their own vows and walked down the aisle to a soloist singing John Legend's "All of Me." They also did a sand ceremony in honor of Charles' mother, who could not attend the wedding. 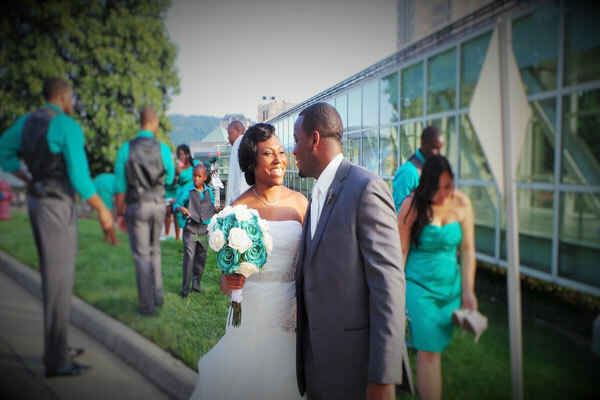 To Shemeka, all these details made her "dream wedding" come to life. Every request was catered to by Shemeka's mother, who planned the wedding. 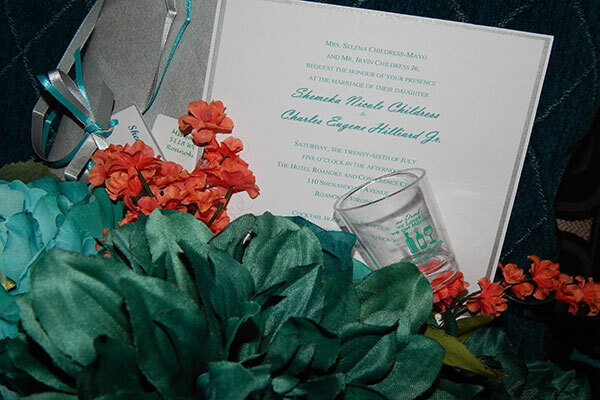 The Hotel Roanoke Ballroom was filled with fun shades of turquoise and coral and had the perfect throwback party feel. All the guests were invited to dance and laugh the night away with the bride and groom, and they even got to take a bit of the celebration home with them in the form of festive shot glass favors-- the perfect way to commemorate a couple who knows how to party! Be sure to see the Hilliard wedding on page 116 of the third issue of bridebook!